Bank 1st offers a safe and secure way to dispose of sensitive documents, such as bank statements and tax documents. 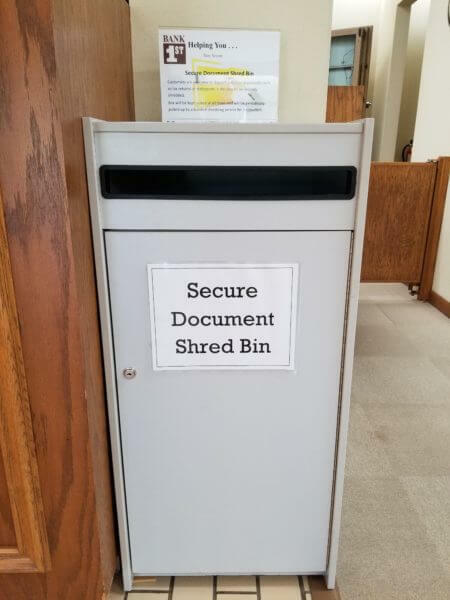 Located in the Main Bank lobby, the Secure Document Shred Bin is kept locked at all times to ensure customer confidentiality. Periodically a bonded shredding company empties the bin and its contents are taken to a secure facility for destruction. This service is provided to Bank 1st customers at no charge.